Fall is an ideal time to plant many woody trees and shrubs. Before grabbing the spade and digging a hole, Rhonda Ferree, Horticulture Educator with University of Illinois Extension, suggests that there are several important factors to consider. These include the suitability of the site where it is to be planted, the species involved, growth characteristics of the tree, the tree's age, and how the nursery plants were grown. Nursery stock is usually offered for sale in the following ways: bare root, packaged, potted, container grown, and balled and burlapped. According to Ferree, these designations relate to the way the plants were grown and how they are being marketed. Bare-root stock has exposed roots that are very susceptible to drying out and therefore need to be kept moist until planting. Packaged plants are similar to bare-root plants, except they have their roots in a loose, moist organic material. Potted plants are bare-root stock that have been potted into containers and sold shortly thereafter. Potted plants differ from container-grown plants in that they were not grown in the original containers. Balled and burlapped stock are generally more durable than their bare-root counterparts because they contain a large soil ball with the root system relatively still intact. 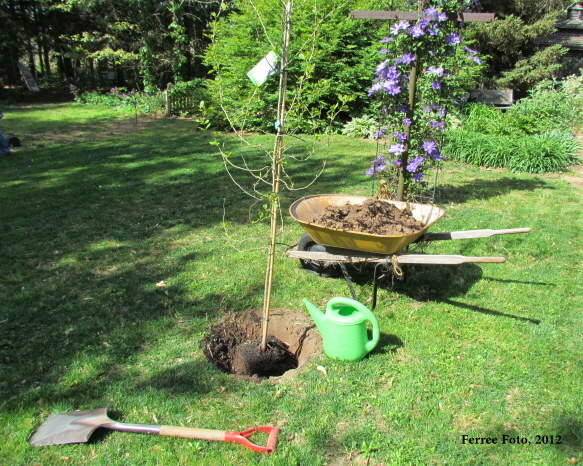 To plant a tree, Ferree recommends digging a hole about 50 percent wider than the root ball or root spread of your tree. It is extremely important to plant all trees at the same level in the soil at which they were originally growing—no shallower and no deeper! Starter fertilizer can be applied with the first watering after planting. Once the tree is set into the planting pit, the backfilling should be done by shoveling in and firming the soil around the root ball. Ferree recommends that a water basin be formed around the base of the plant to hold water, allowing it to soak in rather than running off. When watering new trees, make sure that the plants never dry out. Keep the soil moist at all times during the first season. It is also a good idea to mulch newly planted trees with shredded hardwood bark, compost, or coarse peat moss. These materials conserve moisture, retard weed growth, and help maintain a more even soil temperature. A 2 or 3-inch mulch is usually sufficient for one season. For more information on this or other horticultural issues, contact your local Extension office by visiting www.extension.illinois.edu. You can also post questions on Rhonda's facebook page at www.facebook.com/ferree.horticulture.